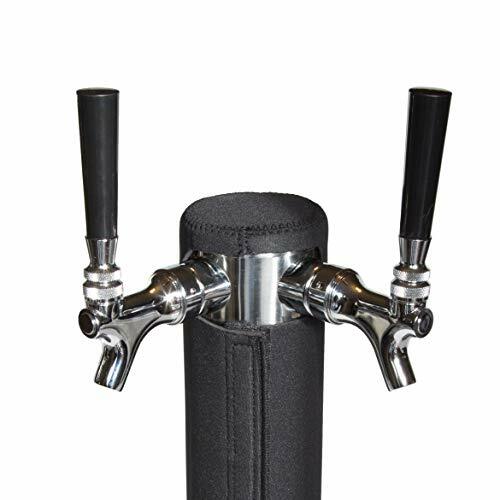 MAINTAINS ICY COLD BEER TOWERS: Ensure that every pour from your draft beer tower comes out icy cold. Even the first! Insulate your tower with this simple to use kegerator Tower Cooler accessory. END FOAM NOW: Maintain a constant temperature throughout your kegerator system with a Tower Cooler Chiller. Beer warms rapidly through a poorly insulated beer tower causing foam to form...in your cup! SAVE ELECTRICITY WITH LITTLE EFFORT: The added insulation of a Tower Chiller will reduce kegerator energy consumption.. Unlike kegerator tower cooler fans, the Tower Chiller takes seconds to install. MINIMIZE CONDENSATION: Kegerator towers sweat. Condensation buildup is a sign of poor insulation and will lead to corrosion and rust. 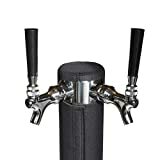 Increase the lifetime of your kegerator and protect your beer tower. HIGH QUALITY MATERIAL AND BUILD: Crafted from high quality neoprene with heavy-duty double stitching. Easy to clean and guaranteed to last. 3" Diameter and 12" Height. Ideal for double tap beer towers.